I think we’ve all been there at one time or another. Perhaps even now you’re facing some harsh difficulty in life. A terminal illness, a dying loved one, a financial setback, job layoff, the list goes on. And everybody's got stuff like that somewhere in life. If you don't now, just wait. As you think about your tough situation there may be nothing good about it as we define good: nothing favourable, agreeable, pleasant, or nice. And then, almost as if to mock us, we have Romans 8:28 suggesting those hard times are somehow good. All things? For our good? How can it be true? I believe reconciling this verse with our tough life experiences comes down to a difference in values. We value different things than God does. I value things like comfort, convenience, ease, and being happy and free from pain. And I value these things for those I love as well. They are good things. We should enjoy them when we have them. But God has a different value system. He values Christlikeness over comfort, character over convenience, and holiness over happiness. He has a higher good in view. While we might strive for what is good, He is working for that which is best. How do I know this? The next verse (v. 29) gives God's purpose as “to be conformed to the image of his Son.” That's Christlikeness. It doesn't say His purpose for us is to be comfortable in life. His purpose for those He redeems is to be like Jesus Christ. Romans 5:3–4 says God values character over convenience for us, “Not only so, but we also glory in our sufferings, because we know that suffering produces perseverance; perseverance, character; and character, hope.” God wants us to be people of character—compassionate, self–controlled, and humble to name a few qualities He values. Finally there's Ephesians 1:4: “For he chose us in him before the creation of the world to be holy and blameless in his sight.” That's holiness. It doesn't say He chose us before the creation of the world to be happy and without pain. Does all this mean God doesn't like it when life is going smoothly for us and we are comfortable? No. It's just that because His value system is different He will allow those things we value to be set aside for the highest good. If this is God's value system, then how do I transform the difficulties I face into the good result God desires? Look beyond the tough stuff by remembering that God is working in and through all things—everything. He has a higher good in mind than just our temporal good. He has eternal good in view as He is fitting us for heaven. Accept the difficult things He allows, knowing that He loves us infinitely and His ways are infinitely wise. The path to peace amid hard times is to resign rather than resist. It was Job who said, “The LORD gave and the LORD has taken away. Blessed be the name of the LORD,” and “Shall we indeed accept good from God and not accept adversity?” (Job 1:21; 2:10 NASB) Resignation in this sense does not mean giving up in the face of adversity. It means saying with Jesus, “My Father, if it is possible, let this cup pass from Me; yet not as I will, but as You will” (Matthew 26:39). Thank God for the hard things knowing that He is using them to accomplish His good purposes for you. Ask the Lord daily and humbly for the grace, desire, and power to persevere through your tough times. His assurance for us is the same as it was for Paul, “My grace is sufficient for you” (2 Corinthians 12). 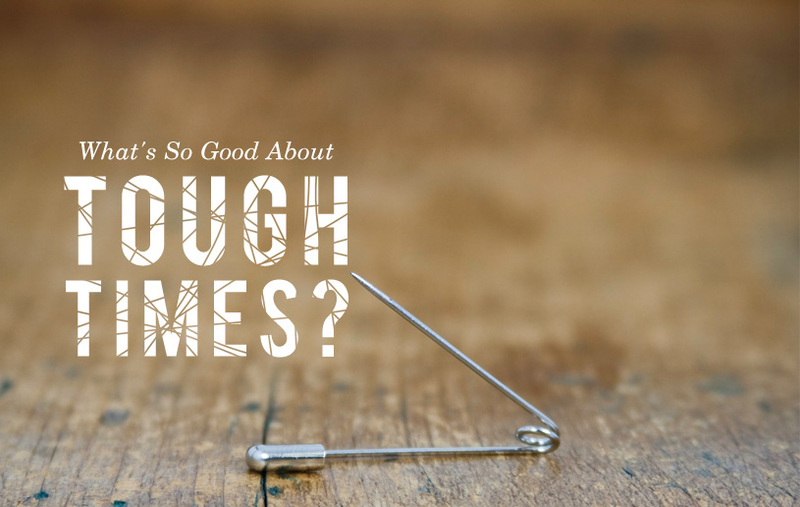 With the right responses, our tough times can be turned into God's good times. 1 Swindoll, Charles R. Strengthening Your Grip: How to Live Confidently in an Aimless World. USA: W Publishing Group, 1998 (194).